Brian Grilli Releases New Album "Deep South Symphony" produced and recorded by Andy Andersson (Fuel) at the legendary Sound Kitchen Studio in Nashville, TN. with a plethora of prominent musicians playing on the tracks. Dan Baird (The Georgia Satellites) is featured on two of the tracks. 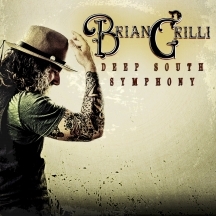 The album has Brian's most mature and personal songs to date featuring such tracks as "Deep South Symphony", "My Hometown", "Keep On Keepin' On", "Unbroken" and more.